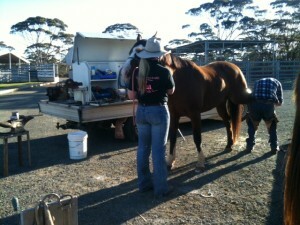 Kalgoorlie farrier Steve Routledge shoeing 'Surprise' with Esther. 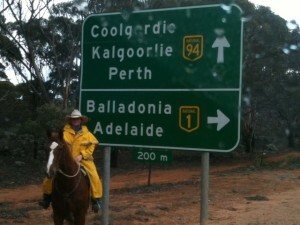 Kalgoorlie is a surprising area. Great people, fascinating environment and to Joe’s joy wild goats all over the place! We pulled in here Friday afternoon to go through quarintine again. We had to get the horses drenched again for liver fluke (previously drenched at Port Augusta), and have the truck washed down. We were able to camp here with the horses for the weekend which has been great and a luxury with BBQ area, hot showers etc and only 15 minutes into Kalgoorlie. Today saw us take in the final Harry Potter movie, felt surreal to be sitting in a cinema after so long in the bush! The trip across from Norseman was wet and muddy! A word about Norseman, another gold mining town (1 pub, 1 store, 1 cafe!) the first since Ceduna 5 weeks ago! It was named after a horse that was called Norseman, when a local farmer a century ago pulled up there and his horse pawed the ground and uncovered a massive gold nugget and the town was born! 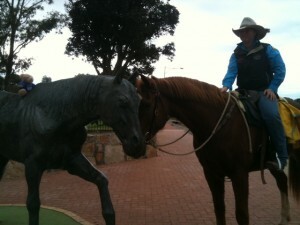 'Titan' & Esther meet 'Norseman' WA. Makes it hard in this country pulling off the road to change horses, have to be very careful to avoid bogging the truck, but I managed. Has been delightful weather, low 20’s during the day down to just our shirts. There are a gazillion mines in this area, mullock heaps abounding. Just up the road from here is a massive nickel smelter. Half the vehicles on the highway are mine utes (all covered in red mud, they’ve had nearly two inches of rain this last week). Perth in our sights again! We’re going through Coolgardie tomorrow and taking the next three days to get to Southern Cross (my paternal grandmothers childhood home) they had a wheat farm there a century ago. It feels surreal being back in ‘civilisation’ after so long in the bush. The thing that blows me away is after so long of counting every drop of prescious water having hoses at truckstops, there’s a hose and water trough in every yard here at quarantine…..keeping up with water was a big challenge since we left Ceduna 31 days ago. Thats nearly 5 weeks of watching every drop. The Nullarbour roadhouses predominantly relied on their own desalination plants or rainwater. showers were mostly costed out at $1 for 3-5 minutes and were coin operated. I don’t think that would’ve covered the cost really of the deisel to run generators and their desalination plants! And we so appreciate the generosity of the Managers who gave us water. Most people drive across the Nullarbor in two days from Ceduna to Norseman, we took 5 weeks! The ladies at Eucla Roadhouse generously donated us a box of fruit and veges to keep us going to Norseman! Human food wise we’d planned two red meat meals a week, a couple of tuna meals, beans and eggs! We had a well stocked tucker box, plenty of long life milk, flat bread etc. Coped really well. We had Viv Kyle from Kempsey and her family do a drop off of beer and chocolates on their way back from Perth! Awesome!! Crossing the Nullarbor these last 5 weeks has been totally awesome. I’ve seen some of the most awe-striking country in my life and the grandeur and majesty of it has taken my breath away. I feel like 5 weeks was to fast to take it all in it is such a vast landscape, and that’s just following the Eyre Highway! One of my greatest discoveries on this trek has been the stories of Daisy Bates, a notable Australian pioneering woman who in the 20s lived on the Nullarbor with Aboriginal communities for 16 years to understand more about traditional life and the impact of European settlement on Aboriginal culture. Certainly on my agenda to read up on the history of her life. This entry was posted on Sunday, July 24th, 2011 at 9:39 pm	and is filed under General. You can follow any responses to this entry through the RSS 2.0 feed. You can leave a response, or trackback from your own site. Hi darling ones, your words, as they often do Maus, bought a tear to my eyes. I loved what you said about the Nullabor and yes to walk or ride out their really slowly would be mind blowing. And Esther what you take on and can accomplish will also always be mind blowing. Much love to you all.